For complete information, click the ‘Technical’ button at the top right. Shake bottle prior to use. Do not “free pour” into aquarium, which may result in excessive, persistent cloudiness. Reoccurrence of cloudy water after Clarifī-SW has been employed to satisfactorily clarify water is an indication that issues referred to in Technical Background (opposite panel) may need to be addressed. The long-term successful care of aquaria relies upon the employment of sound husbandry principles. Clarifī-SW is not formulated to remedy water discoloration (e.g. “yellow” tint) caused by dissolved organic material; instead, employ activated carbon (e.g. 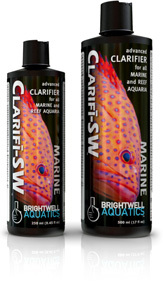 Brightwell Aquatics Carbonīt-P) and/or macroadsorptive resin (e.g. Brightwell Aquatics OrganītR) for this purpose.